I liked the increasingly near constant use of music (even when it became gratuitous by them played choral music on the radio over the police interrogation) and The Pyx has a very interesting narrative structure that I think works well. However much of The Pyx feels outdated and seemed to drag on. The performances were good but there were just long stretches were nothing much happened. I have the Scorpion Releasing DVD edition set aside but when I went to get it the things was gone (?) so I was disappointed to see the archive.org streaming cropped badly. The cult leader is great and his subtle supernatural undertones are well played. Edit: Wikipedia tells me that Karen Black did some of the singing, interesting. Last edited by Undeadcow; 10-30-12 at 05:24 PM. I think you god about as good a handle on it as me. I am not catholic but another idea could be that they choose her because she was a whore no one would care (and was (subjectively) hot) if she was found dead in a ditch (no family ties, vetting her thru her pimp first, ect). The communion wafer makes her clean and now they can kill someone innocent of sin? Although that doesn't really work with the upside down crucifix they gave her. Whatever the case I didn't think it was good enough to warrant a second deeper look. Although I might just have been turned off by the muddy YT video and Karen Black who I really don't care for. A review on Amazon.com suggested the cropped picture made some scenes difficult to understand. It's possible there is part of the image missing that somehow clarifies the pyx concept (?). The copy I had was terrible. One of those discounted 6-packs. I live about an hour from Montreal and it's always cool to see some representation from its seedier period. The film has some very good stuff, but overall is a bit too plodding and dry especially for me this late in the challenge. Can't recommend. I just realized this is the fourth year in a row that my subset pick is a film based heavily in religion. Not an intentional ongoing theme, just a random observation. 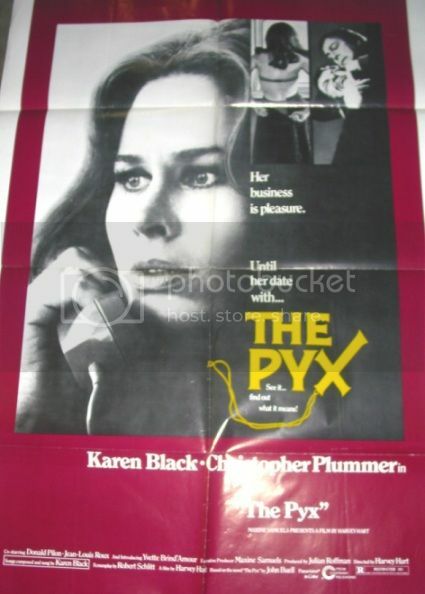 I find The Pyx to be a thoughtful and overlooked gem of Canadian horror. It starts with Elizabeth's fall and then goes back and forth between her life leading up to it and Henderson's investigation. Both strands of the story line are intriguing, and the constant back and forth between the two gives the film a mournful atmosphere. We watch as Elizabeth tries getting her life on track, wanting to leave drugs and prostitution behind her, all while knowing that things don't end well for her. Plummer's detective is a lost soul in his own right, harboring a few demons which remain from circumstances surrounding the death of his wife. The sense of regret and overall sadness is predominant throughout, never letting up. Harvey Hart paces the film so as to let the mystery grow ever so slightly with each frame, all while garnering it's power from mood and character. I feel that Black has never been better than she is here. Plummer also excels, especially in his final scene, the one where he comes face to face with Elizabeth's killer and his own inner demons all at once. The slow-burn pacing certainly won't please everyone, but I think it works beautifully in bringing out the aspects that make this film shine. When all is said and done, the mystery at the core is brought to a satisfying conclusion, the scene detailing Elizabeth's fate and the end confrontation being the best of the picture. Special mention must be made of the bizarre music used during the cult gathering. I thought it added immensely to the atmosphere of the scene. Likewise, the song sung by Karen Black herself over the opening credits sets the mood for the somber events to come. This was based on a book. I haven't read it, but apparently it's even less clear in Keerson's intentions than the film itself.